Julian Assange Says WikiLeaks Will Share CIA Code With Tech Companies : The Two-Way WikiLeaks on Tuesday disclosed the hacking tools from the so-called Vault 7 series. Now Assange says his group will be working with big manufacturers to develop fixes. WikiLeaks founder Julian Assange held a news conference Thursday that was livestreamed from the Ecuadorean Embassy in London. WikiLeaks will be sharing alleged CIA hacking techniques with major technology companies such as Apple and Google to allow them to develop fixes for vulnerabilities in their phones and other electronic devices, according to Julian Assange. 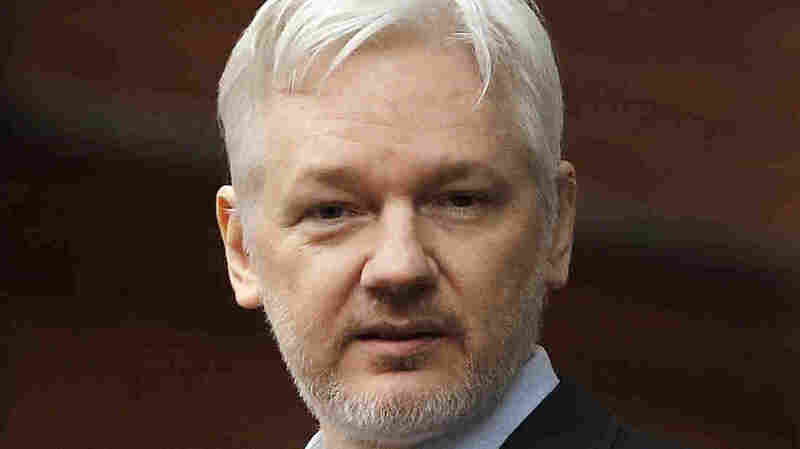 In a lengthy address from Ecuador's Embassy in London, where he remains holed up since 2012, the WikiLeaks founder said the group would work with manufacturers to "disarm" purported CIA hacking tools. When the fixes are in place, he said, WikiLeaks would publish the code for those tools online. On Tuesday, the group published what it calls a trove of internal CIA documents describing agency techniques and programs for hacking into phones, computers and Internet-connected appliances. Many of the techniques take advantage of flaws in software that make programs or devices vulnerable. The document dump did not include the code itself. Instead, it consisted of user guides, troubleshooting manuals, program specifications and developer chatter. WikiLeaks said Tuesday it was "avoiding the distribution of 'armed' cyberweapons" until there was a "consensus" on how to disable the tools. On Wednesday, the group suggested on Twitter that it might work with major tech companies to fix the vulnerabilities that allow the tools to work. On Thursday, Assange confirmed that would be the group's strategy. "We have decided to work with [manufacturers] to give them exclusive access to the additional technological details we have so that fixes can be developed and pushed out," Assange said. "Once this material is effectively disarmed by us we will publish additional details." He did not give a timeline for that publication. It was not immediately clear how the tech companies would respond to the WikiLeaks offer. Apple, for example, said Tuesday that it had already patched many of the problems cited in the WikiLeaks document dump, which allegedly covers the period of 2013 to 2016. The CIA hasn't confirmed the authenticity of the documents released in the dump, but has criticized WikiLeaks for what it says is an attempt to undermine the agency's operations. Immediately after Assange spoke on Thursday, CIA spokeswoman Heather Fritz Horniak responded by saying that the "CIA continues to aggressively collect foreign intelligence overseas to protect America from terrorists, hostile nation states and other adversaries." She added: "As we've said previously, Julian Assange is not exactly a bastion of truth and integrity." In the news conference, which was livestreamed online, Assange repeated WikiLeaks' assertion that the CIA has lost control of its vast collection or hacking techniques. "This is an historic act of devastating incompetence to have created such an arsenal and stored it all in one place and not secured it," he said. Assange appeared in a dark suit and red tie, occasionally shuffling papers as he spoke. Over his shoulder, the WikiLeaks icon was present. He also suggested it was possible the CIA was using some of the tools against Americans, which is prohibited by law. He said WikiLeaks is investigating IP addresses associated with U.S. computers, to determine if they are "attack systems" controlled by the CIA or "victims" targeted by the CIA. WikiLeaks has not released those IP addresses. On Wednesday, the CIA denied that it targets Americans through electronic surveillance, saying the agency "is legally prohibited" from targeting Americans and that it "does not do so."